Odontogenic keratocyst (OKC) was first described by Philipsen in 1956, and few of its characteristic features were later described by Pindborg and Hansen in 1963. Since then, controversies about its cystic or neoplastic nature have led to changes in its nomenclature. The 2005 WHO classification included this lesion under the category of odontogenic tumors and suggested the term “Keratocystic Odontogenic Tumor” to describe all cases. However, recently, in January 2017, the WHO reclassified keratocystic odontogenic tumor as an OKC. Known for its locally aggressive nature, the potential for recurrence and multiplicity, OKCs arise from remnants of dental lamina. Impacted teeth are associated with OKCs in 25%–40% of cases and are difficult to distinguish from dentigerous cysts. 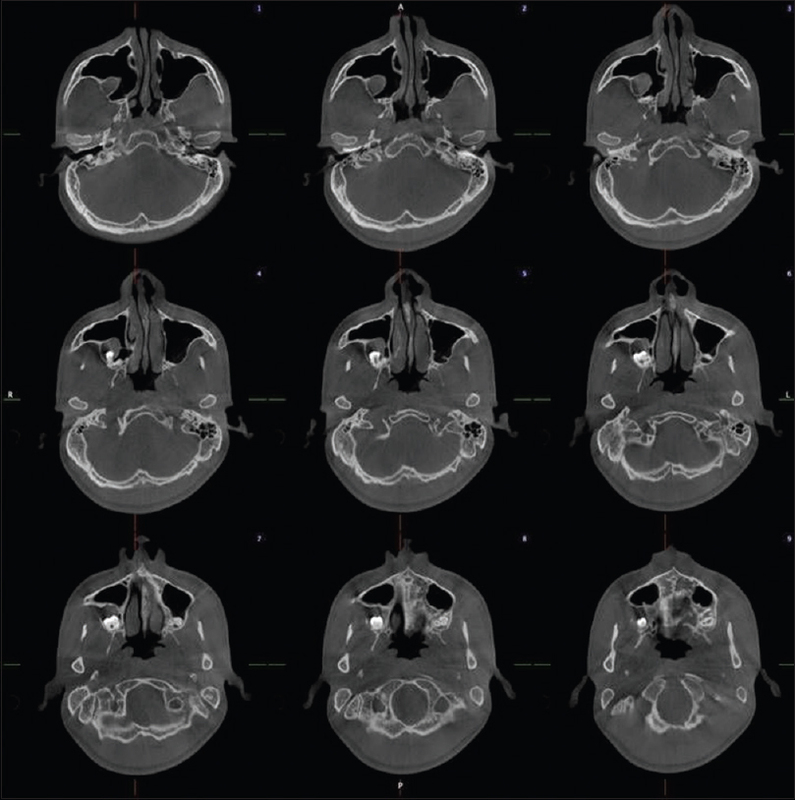 We present a case of OKC of the maxillary right posterior region which resembled a dentigerous cyst radiographically. A 24-year-old male patient reported with the chief complaint of pus discharge from the right upper back tooth region for 1 year. Extraction of the tooth was then done; however, the pus discharge continued and was accompanied by occasional throbbing type of pain. Extraoral examination revealed no gross facial asymmetry. On intraoral examination, obliteration of the upper buccal sulcus in the region of maxillary right first and second molar was present along with missing maxillary right second molar. On palpation, tenderness and pus discharge were present from the gingivobuccal sulcus in relation to the maxillary right first and second molar region [Figure 1]. On electric pulp testing, 16, 15, and 14 were vital. Intraoral periapical and maxillary right lateral occlusal showed the missing maxillary right second molar along with impacted 18 [Figure 1]. Panoramic radiograph revealed impacted maxillary right third molar and haziness of the right maxillary sinus. 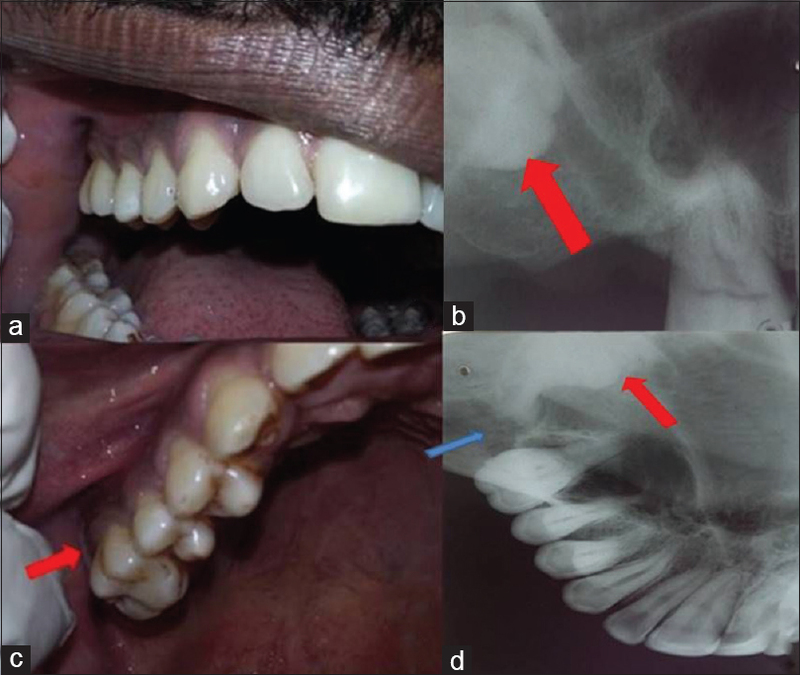 A well-defined radiolucent lesion was also seen in the mandibular anterior region in the periapex of mandibular central incisors and was suggestive of a periapical cyst [Figure 2]. Cone-beam computed tomography (CBCT) axial section showed impacted maxillary right third molar with the presence of a well-defined lesion with sclerotic border extending into the right maxillary sinus. The tooth was located anteroposteriorly [Figure 3]. Coronal section revealed a well-defined lesion surrounding impacted right maxillary third molar and extending into the right maxillary sinus [Figure 4]a. Sagittal section showed the impacted maxillary right third molar surrounded by a radiolucent lesion extending into the sinus and communicating with the alveolar crest [Figure 4]b. Cross section of the maxillary right third molar region showed buccal cortical expansion and perforation. The internal content of the lesion was hazy [Figure 4]c. Three-dimensional reconstruction showed a horizontally impacted third molar with the crown facing anteriorly [Figure 4]d.
Based on the clinical and radiographic features, a provisional diagnosis of infected dentigerous cyst followed by OKC was considered. The patient underwent the removal of impacted maxillary right third molar along with cyst enucleation. Histopathology showed the epithelium which was 6–7 cell layers thick showing the palisaded arrangement of basal cells and nuclear hyperchromatism. 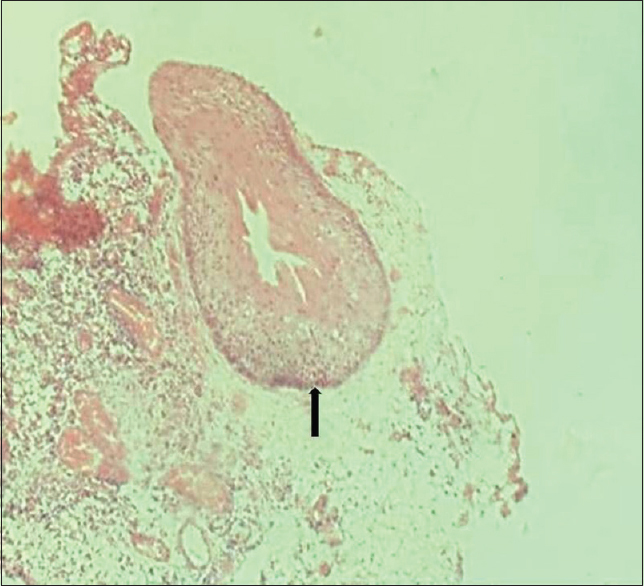 Daughter cyst-like areas were present in the connective tissue capsule [Figure 5]. A final diagnosis of OKC was made. The patient reported, 8 months later, with pus discharge from the maxillary second and third molar regions. 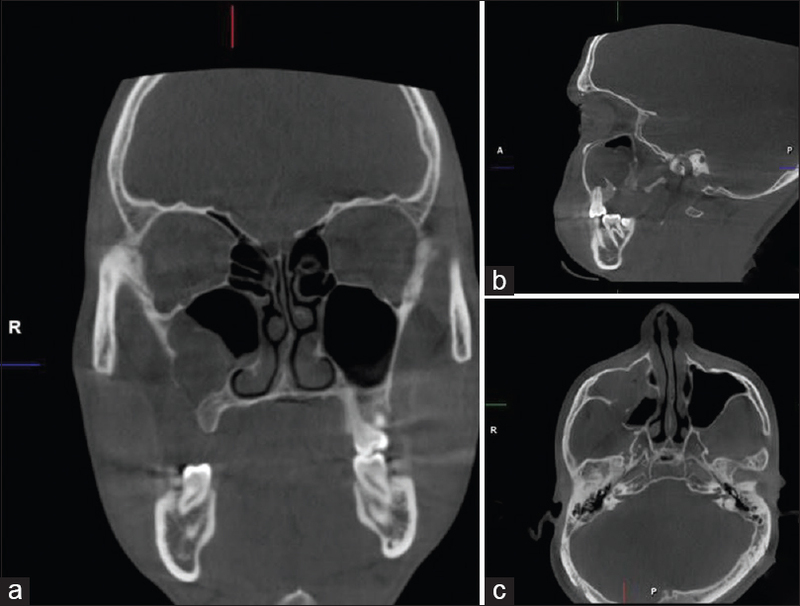 CBCT coronal section showed opacification of the lateral aspect of the right maxillary sinus with thinning of the lateral wall [Figure 6]a. Sagittal section showed opacification in the lower two-thirds of the right maxillary sinus with well-defined borders [Figure 6]b. Axial section revealed opacification of the right maxillary sinus with displacement of the medial wall and expansion and perforation of the posterior wall [Figure 6]c. Based on the history and CBCT findings, recurrent OKC was considered. Surgical excision of the lesion was done followed by the application of Carnoy's solution. Histopathology confirmed the diagnosis of a recurrent OKC. It accounts for 12%–14% of jaw cysts with a slight male predominance. The diagnosis of an OKC is difficult since its presentation is nonspecific. It commonly occurs in the 2nd or 5th decade of life. OKC's arise from remnants of the dental lamina or the basal layer of oral epithelium and are therefore seen commonly in the tooth-bearing areas of the jaw. The most common site is the third molar region of the mandible. Maxillary occurrence is rare with only 16% of cases. The clinical features commonly encountered include swelling, discharge, and pain in approximately 40% of cases. However, very often, it is identified during a routine radiographic examination. Imaging used in the diagnosis ranges from the panoramic radiograph to CT and CBCT. The extent of the lesion, cortical expansion, root resorption, and invasion into the surrounding structures can be well assessed using CBCT, especially in maxillary lesions. Radiographically, it presents as a well-defined unilocular or multilocular radiolucency with smooth, scalloped, or corticated margins and can, therefore, be indistinguishable from many odontogenic cysts and tumors. The only consistent radiographic feature of an OKC is its lack of cortical expansion even in large lesions. The present case reported here describes an impacted right maxillary third molar surrounded by a well-defined unilocular radiolucency. The differential diagnosis of pericoronal radiolucencies includes dentigerous cyst, OKC, unicystic ameloblastoma, adenomatoid odontogenic tumor, and calcifying epithelial odontogenic tumor. OKC demonstrates aggressive behavior and is associated with a high recurrence rate of around 62.5%. Recurrence rate depends on the treatment protocol, the association with an impacted tooth, thickness of the cyst lining, mucosal extension, and presence of daughter cysts. Other reasons include high fibrinolytic activity in the cyst wall, high mitotic activity, epithelial proliferation in connective tissue, and residual dental lamina leading to new cyst formation. As yet, there is no consensus on the best method to manage an OKC. Conservative methods include enucleation, curettage, or marsupialization, while ostectomy, en bloc resection or use of chemical agents such as Carnoy's solution is used in aggressive management. Carnoy's solution consists of 1 g of ferric chloride, 6 ml of absolute alcohol, and 1 ml of glacial acetic acid. Earlier formulations contained chloroform, but due to its carcinogenic properties and risk for reproductive toxicity, it is generally avoided. When used after conservation excision of OKC, Carnoy's solution is believed to decrease the recurrence rate by causing a superficial chemical necrosis. The ultimate aim of the treatment is to reduce the recurrence rate with the least morbidity. The histopathological features are distinctive with a thin lining of stratified squamous epithelium, an 8–10 cell thick spinous layer, a keratinized lining, connective tissue capsule, and a lumen with desquamated keratin. To conclude, OKC has a nonspecific clinical and radiographic presentation, as in the present case where it resembled a dentigerous cyst. Conservative methods, such as tooth extraction and enucleation, are associated with increased recurrence, as in the reported case. OKC needs to be considered in the differential diagnosis in cases with unilocular radiolucency surrounding an impacted tooth as the treatment plan varies accordingly. Further, there is a need to keep patients diagnosed with OKC on regular and long-term follow-up posttreatment. Philipsen HP. Om leratocyster (kolesteatoma) I kaeberbe. Tandlaegebladet 1956;60:963-80. Pindborg JJ, Hansen J. Studies on odontogenic cyst epithelium 2. clinical and roentgenologic aspects of odontogenic keratocysts. Acta Pathol Microbiol Scand 1963;58:283-94. Habibi A, Saghravanian N, Habibi M, Mellati E, Habibi M. Keratocystic odontogenic tumor: A 10-year retrospective study of 83 cases in an Iranian population. J Oral Sci 2007;49:229-35. Borgonovo AE, Bernardini L, Francinetti P, Rizza F, Re D. Odontogenic keratocyst mimicking paradental cyst. Case Rep Dent 2014;2014:974241. Sánchez-Burgos R, González-Martín-Moro J, Pérez-Fernández E, Burgueño-García M. Clinical, radiological and therapeutic features of keratocystic odontogenic tumours: A study over a decade. J Clin Exp Dent 2014;6:e259-64. 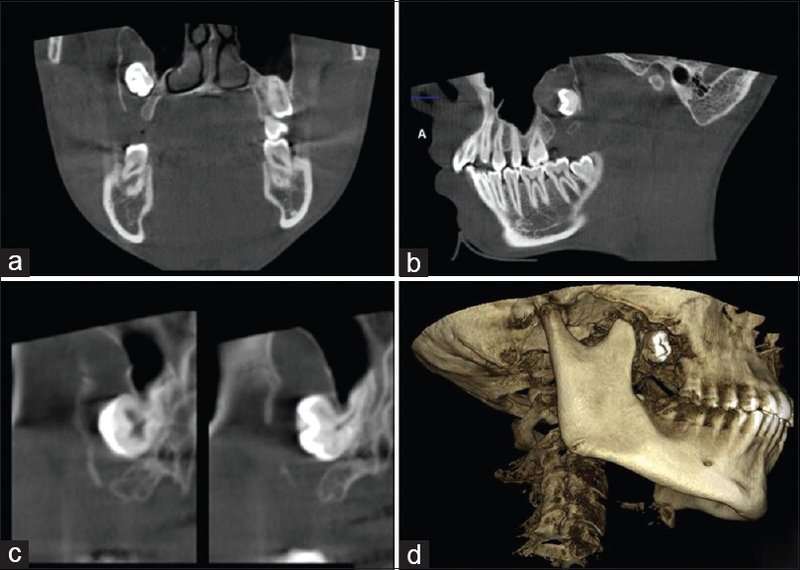 Shephard M, Coleman H. Simultaneous adenomatoid odontogenic and keratocystic odontogenic tumours in a patient with Gorlin-Goltz syndrome. Aust Dent J 2014;59:121-4. Vencio EF, Mota A, de Melo Pinho C, Dias Filho AA. Odontogenic keratocyst in maxillary sinus with invasive behaviour. J Oral Pathol Med 2006;35:249-51. Alchalabi NJ, Merza AM, Issa SA. Using carnoy's solution in treatment of keratocystic odontogenic tumor. Ann Maxillofac Surg 2017;7:51-6. Güler N, Sençift K, Demirkol O. Conservative management of keratocystic odontogenic tumors of jaws. ScientificWorldJournal 2012;2012:680397.